For thousands of years, men and women in rural parts of the country have used a rich substance as fuel and fertiliser. Usually sold locally, this natural matter has now found a new market, thanks to e-shopping. In the process, it has given women in villages an additional income. Shanti, a 24-year-old woman from Sikhera village in Bulandshahr district, Uttar Pradesh, says she earns five times more by selling cow dung mixed with hay to a trader than she does by selling it in a local market. The trader packages the dried cow dung patties and sells them to an e-tailer. 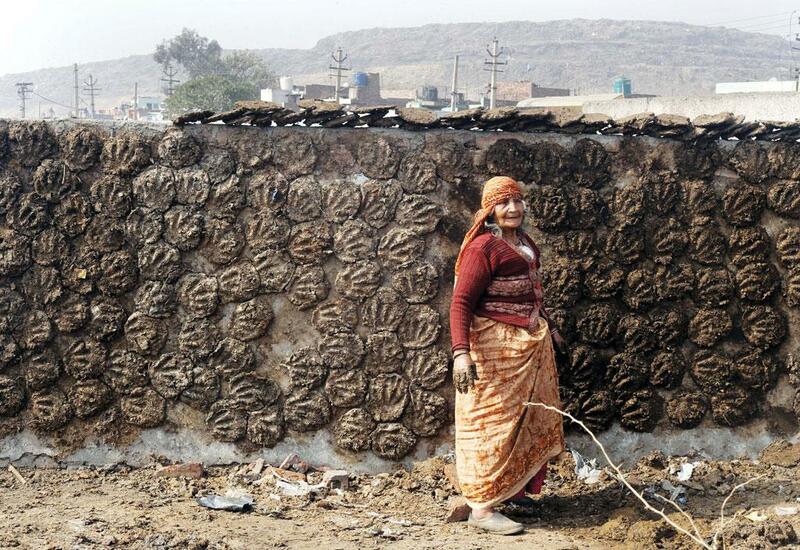 The e-business of cow dung cakes involves e-tailers, local traders and villagers. After collecting dried dung patties from the village, the trader packages and sells them in bulk to e-tailers or other sellers. Shopping websites such as eBay.in, Amazon.in, and Shopclues.com sell the patties in packs of eight, 15 and 24 to customers ranging from farmers looking for compost to the everyday householder, who needs it mainly for religious rituals. The e-tailers also ship them to the non-resident Indian population across the world. The price per cake depends on the quality, region and weight. E-tailers say they sell 300 to 400 dried dung cakes every day and the profit margin is about 30 per cent for most of the stakeholders. For women like Shanti, selling cow dung patties to a local trader helps supplement her household income. She earns between Rs 70 and Rs 115 a day by selling 120 to 150 cakes to a company in Meerut. While cow dung costs 75 paise per cake, bullock’s dung costs 45 to 50 paise per cake in her village. A representative from the company collects them from her house, saving her the cost of transportation. The mother of two says this adds to her husband’s daily wage of Rs 150. “If we sell it in the local market, we do not earn more than a rupee for 10 cakes,” she adds. Traders say the demand for dung is picking up in cities. 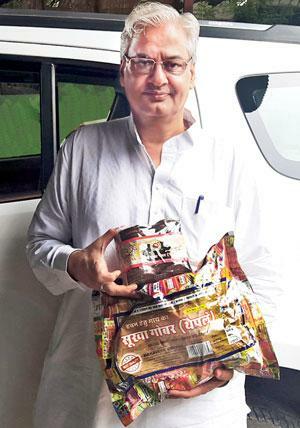 T Kannabiran, owner of Bhushanam Enterprises that supplies dung cakes in Tamil Nadu, says the demand is usually from cosmopolitan cities where cattle are scarce. A spokesperson from Amazon India also says their orders are primarily from cities. The burning of cow dung has become a fad with people living in cities, making it a booming business, adds M Sankaran, co-owner of Bhushanam. In ayurveda, dried cow dung mixed with camphor is prescribed as an air cleanser. Organic food culture is also driving the demand since the primary manure for organic vegetables is cow dung, says Sankaran. Fifty-year-old Raksha Bharucha, a homemaker in Mumbai who grows vegetables in her small kitchen garden, buys dung cakes online, and uses them as fertiliser. “In a city like Mumbai, where there are no farms in the vicinity, it becomes difficult to procure cattle dung,” she says. Dung was first sold as a branded fertiliser by farmers in Gujarat (see ‘Branding cow dung’) to provide a cheaper and safer alternative to chemical fertilisers. But the exorbitant cost of dung patties on some websites is a worrying trend. Though there are no reliable estimates of the business, Kothari offers hope. “If we correct the pricing, the business will develop in a few years with sustained orders from customers,” says Kothari. The MODELof selling dung as fertliser was implemented first in 2008-2009 in Navli village in Anand district, Gujarat, the epicentre of India's White Revolution. With the large number of cattle at their disposal, a pair of enterprising farmers in the village in central Gujarat started packaging and selling cow dung mixed with poultry waste, castor oil cakes, sugar cane paste and gypsum as organic manure and earned a profit of Rs 1-1.5 lakh per month. The mix is treated with bacteria in a pit for a few days and marketed under Hiranyam Organic Fertiliser and Krushi Ami. These became extremely popular with farmers in the region. According to M V Patel, Professor and Head, Department of Agronomy, the manure is used by farmers in Anand, Kheda, Kachchh, Bhuj, Rajkot, Jamnagar, Sabarkantha, Banaskantha and Surendranagar districts. "A bag of this fertiliser is sold for Rs 120 as opposed to the chemical fertliser which costs Rs 500. It is eco-friendly and safe," says Patel. The article was published in the August 1-15, 2016 issue of Down To Earth magazine.